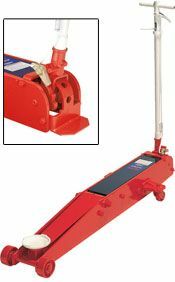 Many years ago we developed the NORCO Model 71202A 2 Ton Capacity Floor Jack with the professional user in mind. First, we wanted it to be made to meet the ANSI ASME/PALD standards, so we had to make it tough and safe to use. Next, we wanted it to be a feature packed product for high performance. I can’t tell you how many times I’ve heard, “You put nylon wheels on a floor jack? What in the world are you thinking?” When we first started selling the 71202A, it had steel wheels as standard equipment and we offered the nylon wheels as an option. Because of our high standard of building quality into our products, NORCO is approved by GM, Ford, Chrysler, Toyota, Honda, and many other OEM’s equipment programs. These car companies spend hundreds of thousands of dollars on epoxy floors to keep their service areas nice and clean. By adding the nylon wheels, we reduced the chance of marking or cracking floors during use. Add in the trend to use tile for flooring, and there is even more reason to use nylon instead steel for wheels. In 2007, the optional nylon wheels were requested by car dealers 80% of the time. So, we just made it a standard product offering. Of the thousands of jacks we have sold since then, we’ve only had to replace one set of nylon wheels. The durability of nylon should not be underestimated! Did I mention how much more quiet they are when rolling the jack through a shop? Durability, Reliability, Performance… and Quiet too! While all of our jacks will give you exceptional performance, they typically have some exceptional features too. Let’s step up a bit in weight and look at the NORCO Model 71500E 5 Ton Capacity Floor Jack. First, this jack has a 27 1/4″ high height. Most of the industry offers jacks that range from 23″ to 25″. Have you ever spent much time under a truck that is resting on jack stands? I can tell you that those that have REALLY appreciate two and a quarter more inches of room to move. The tech working his days under that truck is who we thought of when we made it 27 1/4″. And we get plenty of thanks from those guys for doing what we did! Second, our U.S. Patented (#7,055,801 B2) FASTJACK feature allows the technician to lift the saddle to the lift point with just one stroke of the handle. Yes, one stroke! From there it takes a lot less time to raise the load and to get your stands positioned and the truck stabilized on them. So when someone asks, “What’s your price on a five ton floor jack,” you may wish to remind them of these two critical features. The values they add are far beyond their costs! And yes, the same features on our 5 Ton Air/Hydraulic version too!